AP Residential school notification 2020 , aprs 5th class admissions , apreis notification 2020-2021 , aprs 5th class entrance exam official website available here. APRS notification 2020 popularly known as AP Residential school notification and examination details will be announced by Andhra Pradesh Residential Educational Institution Society on behalf of Government of Andhra Pradesh. Applicants who have applied for the APRS exam can check this official notification. This entrance test is conducted on 9th March 2020 during 11:00 AM to 1:00 PM to give admissions for 5th class in different Residential schools across the state for the session 2020-2021. To fill the aprs application form 24th January to 20th Feb 2020, For more details in this regard please visit official website apgpcet.apcfss.in. Candidates can check apreis notification, AP Residential school apply online last date, AP Residential school 5th class admission notification, aprs application 2020 through this article. AP Residential notification 2020 is conducted to give admissions in 5th class in AP Gurukulam schools. Applicants who want to join in 5th class can apply for this APRS Notification. AP Residential school entrance exam will conduct on 9th March 2020. Applicants who have bonofied students of 4th class are eligible to apply for the exam. Candidates have to pay Rs 50 as application fee to write the examinations. Candidates can check once their eligibility criteria before the apply, application forms are available from 24th January 2020, aprs application link is deactivated on 20th Feb 2020. So interested candidates may apply through online only by visiting aprs website aprjdc.apcfss.in. 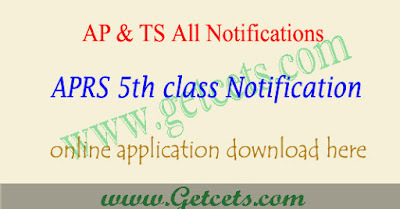 Candidates can download the “APRS 5th class notification Information Bulletin” free of cost from official website aprjdc.apcfss.in from 24th January 2020 onwards. Educational Eligibility : Candidate must be educated indefinitely by the government or government recognized school in 2018-19 and 2019-20 academic years and Candidate should have read the 4th class of the school year 2019-20. Area Eligibility : OC and BC students should be studied in the rural area. SC and ST students should be studied in the urban area along with the rural area are also eligible to apply. 3 — Students belonging to other districts are also eligible for admission in minority gurukulam schools. The 5th class entrance test questionnaire will be given in Telugu and English. The question paper for minorities is in Urdu. The Question paper will be conducted for 100 marks at 4th Class standard. The admission test is administered within 2 hours from the following subjects. Candidates can check aprs notification 2020, AP Residential school apply online 2020 last date, AP Residential school 5th class admission notification 2020, aprs application 2020 through this article.